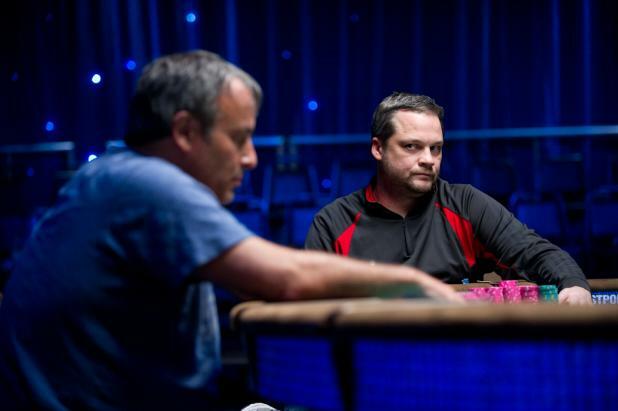 Chris Bell plays a lot of his poker back home in North Carolina, where he frequently plays pot-limit Omaha. His friend Gavin Smith says Bell is one of the best in the world in that game, and Bell's victory in Event #46 ($5,000 Pot-Limit Omaha Hi-Lo) helps prove his point. In his victory interview, Chris Bell especially thanked Erick Lindgren, who couldn't make it to the Rio in time to see Bell win. "I would not be in Las Vegas right now if it weren't for Erick. A lot of people had given up on me the last year or so. But Erick didn't. … Without a friend like him, I would not be here right now." The final hand of Event #46 ($5,000 Pot-Limit Omaha Hi-Lo). Dan Shak was all in on the turn with an ace-high heart flush against Chris Bell, and already drawing dead to Bell's full house. The last card was irrelevant, but slightly improved Bell to a higher full house. 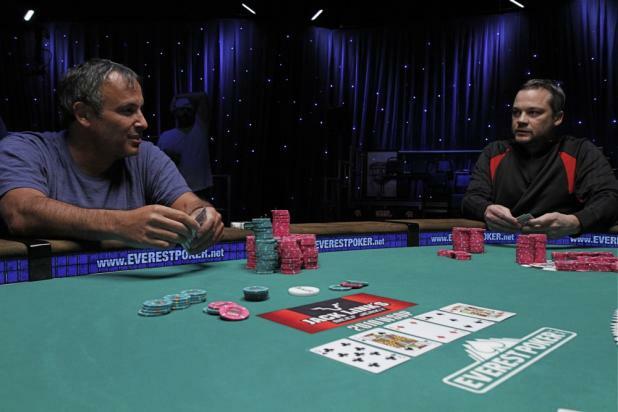 In the final hand of Event #46 ($5,000 Pot-Limit Omaha Hi-Lo), Dan Shak (left) bet the pot on the turn with the board showing Kc-8h-2h-Kh, Chris Bell moved all in, and Shak called with an ace-high heart flush. But he was drawing dead -- Bell had turned a full house (kings full of eights). This photo was taken right after Shak called, and it seems he could already sense the bad news. There were some famous friends in the stands for the final table of Event #46 ($5,000 Pot-Limit Omaha Hi-Lo), even as the action dragged on past 5:00 am. 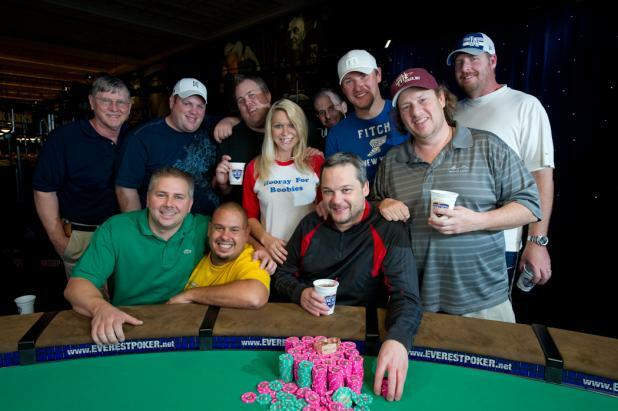 Gavin Smith (standing, right), who won his first WSOP bracelet the night before, is one of Chris Bell's best friends, while Shannon Elizabeth, recent WSOP bracelet winner James "Flushy" Dempsey (seated, first row), and Michael Binger were on hand to cheer for Dan Shak. Chris Bell said, "This isn't fair. Dan has Shannon Elizabeth rooting for him, and I'm stuck with Gavin Smith." Another dozen or so of Bell's friends were sitting on the opposite side of the arena (not pictured). 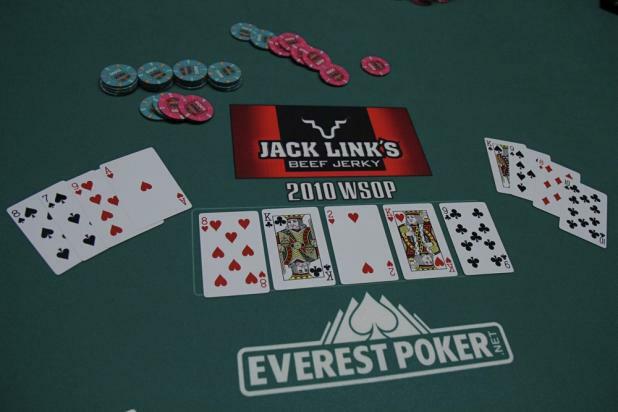 In the key hand of the heads-up battle in Event #46 ($5,000 Pot-Limit Omaha Hi-Lo), the final board showed Js-9c-4d-5s-Kh. Chris Bell (right) moved all in on the river, and Shak called with Qs-8s-Jd-9d for two pair (jacks and nines). But Bell showed As-3d-Kd-Jh for a higher two pair (kings and jacks). Shak said, "Unbelievable," and told Bell that he had made a gutsy call. In his defense, Bell had top pair with a 5-low draw, and told Shak, "You don't have to have the nuts every time." 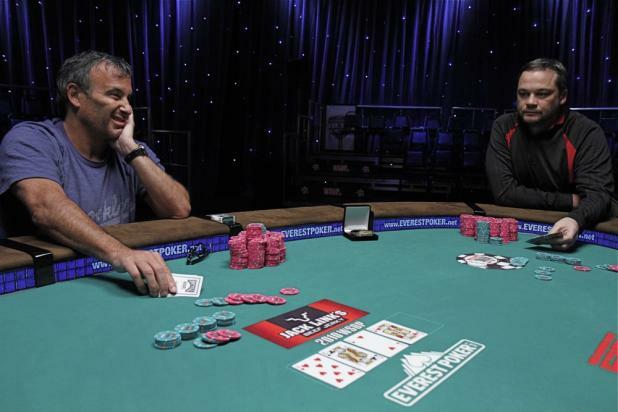 Bell won the pot to double up, and that put them nearly even in chips with the bracelet in the balance. Dan Shak (left) had a big chip lead over Chris Bell with two players remaining in Event #46 ($5,000 Pot-Limit Omaha Hi-Lo). Bell check-called the flop and the turn on a board of Js-9c-4d-5s. With Shak showing strength and Bell putting most of his chips in the pot, it seemed likely that this hand would end the tournament. 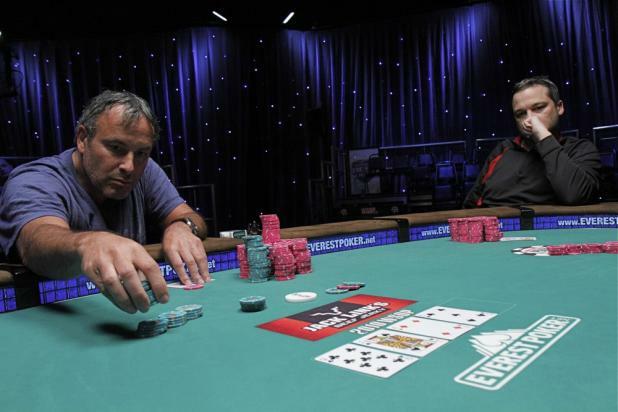 Heads-up for the WSOP bracelet in Event #46 ($5,000 Pot-Limit Omaha Hi-Lo), Chris Bell studies Dan Shak while Shak studies the board. Though they are competing fiercely for the bracelet, the two players like and respect each other. At one point, Gavin Smith confidently predicted, "I'm excited because a friend of mine is going to win a bracelet tonight." Shak replied, "No matter who wins, a friend of mine will win a bracelet too." 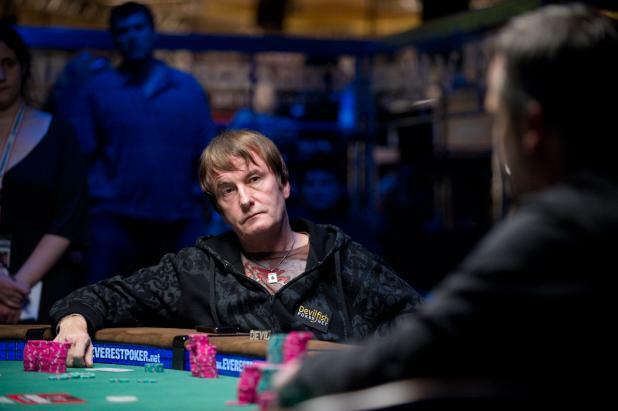 David "Devilfish" Ulliott won a WSOP bracelet in 1997 in $2,000 Pot-Limit Hold'em, but he hasn't been able to close out a WSOP victory since. 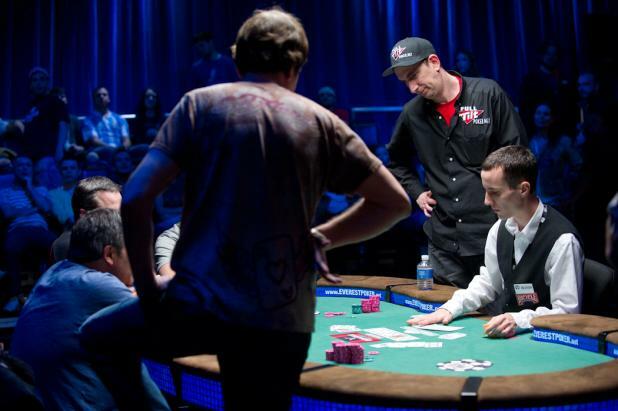 This is Ulliott's 11th WSOP final table, and he has four second-place finishes. He was hoping to claim his second bracelet in Event #46 ($5,000 Pot-Limit Omaha Hi-Lo), but he fell short in third place. 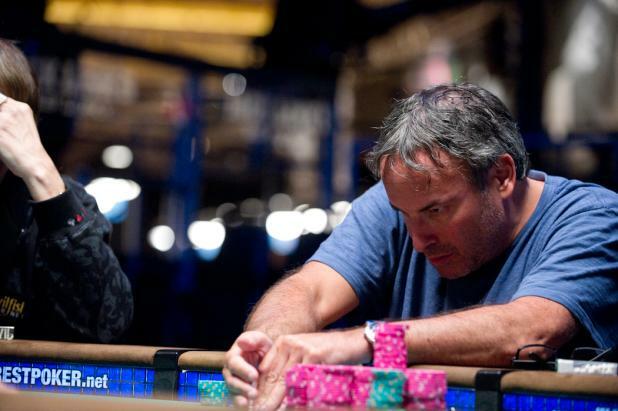 Dan Shak has been in the winner's circle at the World Series of Poker before, but it wasn't in a bracelet event. Shak was one of the final two players in the 2007 Ante Up For Africa charity tournament. Up against Brandon Moran, the two players agreed to declare themselves co-champions and donate the entire amount of the first- and second-place prizes to the international relief effort in Darfur -- a total of $386,738. If Shak believes in karma, he should definitely have some on his side. 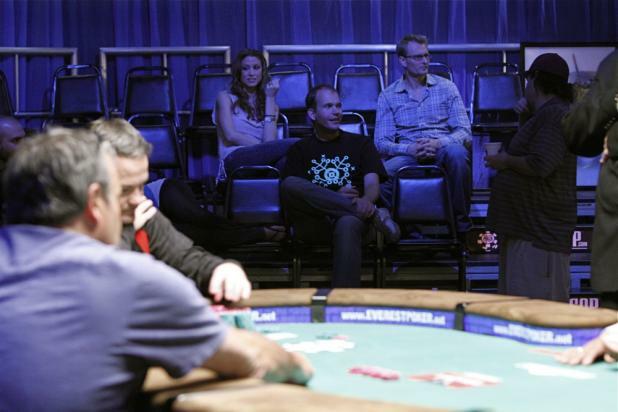 David "Devilfish" Ulliott (foreground, standing) called all in preflop and said, "I don't like this hand, but what can I do?" Ulliott showed Ac-Ad-As-8c. Since Omaha uses only two cards from a player's hand, one of those aces is wasted, and gives him one fewer out. Ulliott was up against Erik Seidel (standing, right), who held Ks-Kc-6c-3d. The board came fairly neutral (Qs-8h-7h-5h-2c), and it was a split pot -- Ulliott took the high, while Seidel took the low.